The hilltop village of Crillon le Brave in Provence is a picturesque place from which to cycle Mont Ventoux, says Lynette Eyb. 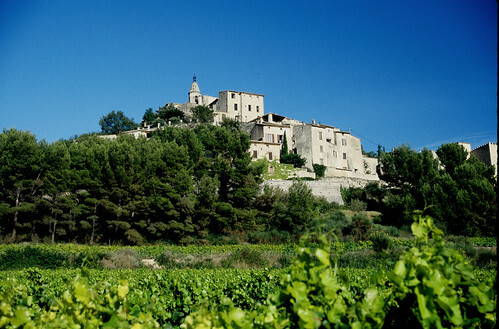 The pretty village of Crillon le Brave sits on a hilltop around 40km north-east of Avignon. Aside from walking and cycling, there's not a lot to do in the town itself, though the vineyards of Châteauneuf-du-Pape and the Côtes du Rhône to the west, the weekend antiques market in nearby Isle-sur-la-Sorgue and a kayak along the Sorgue River can be interesting distractions. But that's all beside the point. 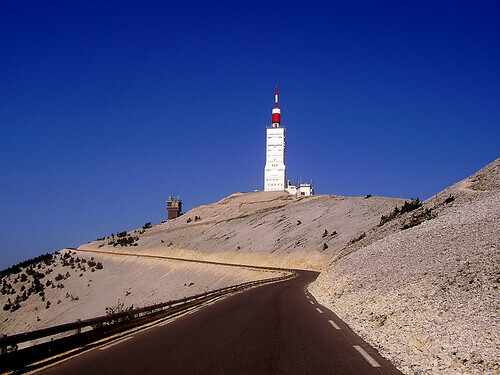 Tourists – particularly those on two wheels – usually pass through here for one reason and one reason only: Ventoux. The rather plush Hotel Crillon le Brave is a strong supporter of cycle tourism (it can arrange hire bikes for guests) and can be a hive of activity in summer months, particularly if the Tour de France is passing through. Here are some local rides that begin and end at the hotel’s door in the heart of the village, starting with the biggest and best of them all (though Alpe-d'Huez might beg to differ). Using Hotel Crillon le Brave as a starting point, follow the signs into Bedoin (another popular base for Ventoux climbers). Ride up the main street of Bedoin and at the roundabout turn right in the signed direction of Mont Ventoux. From here you’ll have 21 straight kilometres of climbing to reach the summit. Once you’ve reached the top and you've taken the obligatory photos, you can either retrace your steps, or descend to Malaucène, and come back via Caromb, Modène, St Pierre, and Crillon. If you need help making it to the top, see our 10 tips for cycling Mont Ventoux, Stephen Lord's advice on climbing mountain passes. Paul Henderson, meanwhile, has done the maths for Freewheeling France to see how Ventoux stacks up against other famous Tour climbs. For more on cycling the Ventoux, see Climb by Bike and the excellent Cycling Challenge: Cycling in the Alps. For a personal take on the conquering Ventoux (including some tips), see Freewheeling France contributor Gerry Patterson's blog. If you need to work your way up to Ventoux, or if you’re keen on a gentler bimble through the countryside while your spouse/friend makes the Ventoux pilgrimage, here are some other options from Crillon le Brave. Using Hotel Crillon le Brave as a starting point, ride straight down the hill past the town hall (the mairie). About 200m along, you’ll see a sign for Bédoin pointing to the left. Instead of going left, bear right and follow the road downhill all the way to the bottom, where you’ll come to the D974. Turn left here and after a very short distance – just before a rest area with picnic benches – turn left again onto a smaller road. At the stop sign, turn right and take the road into Bédoin. To return to Crillon le Brave, retrace your steps along the D138. About 1.5km out of Bédoin, the road curves right and then crosses a small bridge. Just over the bridge, go straight on towards Crillon le Brave (you'll see it ahead in the distance) rather than following the main road to the left. This ride is for the most part on flat and gently rolling terrain, although there are a few hilly parts. The looming presence of Mt Ventoux is never out of sight as you ride through the heart of the Côtes du Ventoux vineyards and the orchards whose beautiful pink and white blossoms mark the beginning of spring in late March and early April. Using Hotel Crillon le Brave as a starting point, follow the main road downhill past the town hall (the mairie). After about 200m, turn sharply left at the little roundabout and head for the village of Bédoin, about 4km away. In Bédoin, look for the D213 and turn right along this road in the direction of Flassan. About 5km out of Bédoin and before descending into the village of Flassan, take a sharp right turn following the sign for Les Gaps. Just past the tiny village of Les Gaps, you’ll join another road. Bear right here up a short hill and follow this road into the village of Mormoiron. Turn right off this road and climb up into Mormoiron (follow the sign for ‘Le Village’). At the top of the hill, turn right on the D14 in the direction of Bédoin. A bit further on, stay on the D14 – don't take the left turn toward St-Pierre-des-Vassols. Follow this road all the way back into Bédoin. 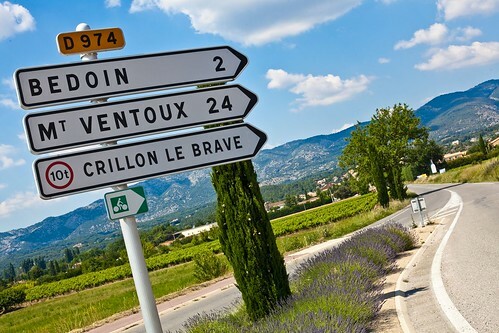 As you come into the centre of Bédoin, you’ll see the sign for Crillon le Brave via the D138. From here on you’re retracing the beginning of the route. About 1.5km out of Bédoin, the road curves right and then crosses a small bridge. Just over the bridge, go straight on toward Crillon le Brave (you will see it ahead in the distance), rather than following the main road to the left. Most of this route is along fairly flat terrain, but for a few kilometres between the villages of Lafare and Le Barroux there is some steep climbing. The climbing is rewarded with pretty views and a nice downhill run. If you wish to view the Dentelles but are hesitant about the steep hill climb, you might consider cycling only as far as Lafare (the half-way point) before turning around. That way you'll stay mostly on the flats. Using Hotel Crillon le Brave as a starting point, follow the main road downhill past the town hall (the mairie) as it curves to the right after about 200m at the little roundabout. At the end of the long downhill run, turn right (just before the bridge) on the D55 and head to Caromb via the villages of St-Pierre-des-Vassols and Modène. Pass through Caromb, following the signs for Beaumes-de-Venise. You’ll cross the D938 and ride on the D21 through the tiny village of St-Hippolyte-le-Graveron. In Beaumes-de-Venise, ride up the main avenue into town and, at the top of it, bear right and follow the signs for Malaucène and Suzette. About 4km out of Beaumes-de-Venise, you’ll have an excellent view of the Dentelles on your left. Continue on to the village of Lafare. If you're keen to get an even closer look at the geological contortions that created the Dentelles, you can take a hilly 5km side trip, following the signs in Lafare for ‘Dentelles de Montmirail’ and ‘La Domaine de Cassan’. The road ends at La Domaine de Cassan, so you must retrace your steps to Lafare. From Lafare, bear right out of the village on the D90A, following the sign for Le Barroux. Here the road starts to climb. As is almost always the case, however, the misery of a steep hill is rewarded with some wonderful views and an enjoyable coast down the other side. On the way up, you pass the charming village of La Roque-Alric, clinging to another unusual outcrop. A bit further on, you crest the hill and begin rolling all the way down to Le Barroux. Le Barroux is worth a quick tour, if for nothing else but to have a look at the Renaissance chateau which dominates the village. From Le Barroux, take the D13 back to Caromb. Bear left when you get into Caromb onto the D70 (sign to Mazan) and then take the second left onto a tiny road that is the ‘Chemin de Crillon’ (the sign marking the road is on the side of a building and is not easy to spot). This road is the most direct route back to Crillon le Brave. You can also use our bespoke bike hire service. This IGN map of the Ventoux is well worth having in your pannier (there is also a waterproof version). There is broader map that takes in the entire Vaucluse/Ventoux area. For those interested in the mountain and its Tour de France myths, Willliam Fotheringham's Put Me Back On My Bike: In Search of Tom Simpson is the haunting story of the man whose memorial sits on the Ventoux near the spot where he died. See also Jeremy Whittle's Ventoux: Sacrifice and Suffering on the Geant of Provence. On a lighter note, Tim Moore cycles Ventoux in French Revolutions: Cycling the Tour de France. For more great books, see our must-read Tour books.